Developers looking to rebrand the White Flint area with a memorable new name decided to call it the “Pike District”. Say what? (April 23, 2015 update: The Pike District now has a logo, discussed here). The White Flint area, up to and including the area around Twinbrook Metro, is being transformed into into a walkable, transit-oriented urban center offering a thriving mix of retail and housing. I don’t understand why anyone would want to rename it after a congested six-lane arterial road. To me the “Pike” – Rockville Pike – conjures up visions of endless strip malls, intolerable traffic and anti-pedestrian conditions, an image we should be trying to get away from. Cyclists avoid the road and pedestrians fear it. I don’t see anyone renaming Tyson’s Corner after unappealing Leesburg Pike. Yes, Rockville Pike will serve several modes of transportation, but it will still be one of the least appealing roads in the White Flint sector, not something we want to highlight. The name “Pike District” seems to violate several rules of marketing. For one thing, it fails to distinguish the “product” from similar products. The name is geographically vague and could just as easily refer to any development along Route 355 or even Columbia Pike. It certainly does not evoke the urbanist character of the development. It’s confusing too. 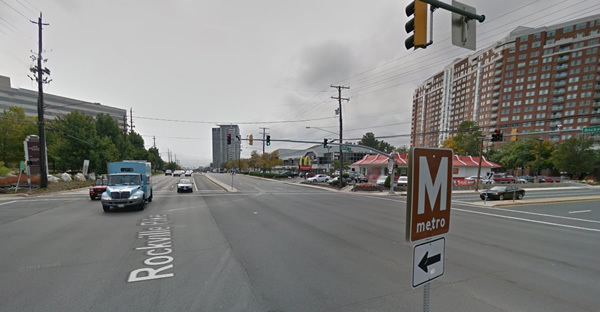 People from outside Rockville may think the “Pike District” is a mere 300 feet wide. Ultimately the name may hinder the project’s intended goals. Granted, the district presents some inherent naming difficulties, since it includes development as far north as Twinbrook Metro, not just the White Flint area. It’s unclear how people will refer to the White Flint and Twinbrook halves of the corridor individually. But there has to be a better name than “Pike District”. Developers appear to have done their due diligence, hiring the consultant StreetSense and letting the community have considerable input. Among the builders are Federal Reality and JBG, enlightened supporters of walking and bicycling. But the naming effort was hindered by disagreement among the developers, some of whom refused to keep the obvious name “White Flint”. Ultimately they presented the community with ten names at a public meeting where attendees could support their favorite names. The names were a motley assortment: Rocksy, The Stem, Market District, Uptown, Slate District, Rockline, Quartz District, The Summit, Pike District and Metropolitan White Flint. Only one, Rockline, conveyed the idea of transit. Perhaps it’s inevitable that selection by community consensus would result in something plain and unmemorable, similar to how home sellers paint rooms a neutral color to appeal to a majority of buyers. At least the name is authentic – the area is centered around the Pike after all. One developer reassured me that neighborhoods can continue to use the names they’ve always been using. There will be no “Pike District” postal designation. He noted that the name is intended primarily for marketing purposes, like the term “I-270 Technology Corridor”. But with newspapers already using the name, I think it will become ubiquitous. A better process (as if we could get anyone to go through this again) would be to hold a countywide naming contest and publicize it through the media and in schools. It shouldn’t take more than a few rounds of public participation to trim the list of submissions down to the best 100 names, then 20 names, and finally 1 name. Call it an old-school form of crowd-sourcing. Note: If you post a comment and it’s not approved within an hour, please send a blank email to email@mobike.org with the subject “approve” or something like that. WordPress is having difficulties – sorry for the inconvenience. Its not named after a road – but rather the fish….just as stinky a name.